As I am currently in the thick of preparing to begin Ambleside Online Year 2 after the first of the year, I thought this might be an appropriate time to begin a little series on how I approach planning and scheduling AO in our home. I am one of those planning geeks who enjoys going through the planning process, and this is one of the reasons that I don’t care for boxed curriculums with a scripted teacher’s manual. But, I realize that for many people, taking the booklist and schedule that Ambleside provides and then trying to translate that into what happens in your home day-by-day can be overwhelming. I hope that outlining my process for you may be helpful for those who find planning for AO a little overwhelming. As an aside: I won’t really be talking about this is this series, but using Ambleside also carries the understanding that you are making an effort to educate yourself in the philosophy and methods that Charlotte Mason espoused. Ambleside is so much more than just a booklist! If you aren’t familiar with CM methods, do be sure to check out the Charlotte Mason resources tab to the right. Look over the Ambleside Booklist for the Year(s) in question, including free reads. Consider any other curriculum needs that we have (math, language arts, supplementary books, art supplies, etc). Check to see what books and materials I already own either as hardcopies or digitally. Check to see what books and materials (including music and free reads) are available digitally. Purchase any hardcopy books and materials we need and arrange to have them shipped to us in Africa. Review books and materials we will be using – this may involve skimming and/or pre-reading and researching ideas others have shared about how they used the books on the Forum. Divide books and materials into three categories: things we will do as a group, things that I will do one-on-one with each individual student, and things I will have the student tackle independently. (These lists will be used to make my checklists once we get to Term planning). 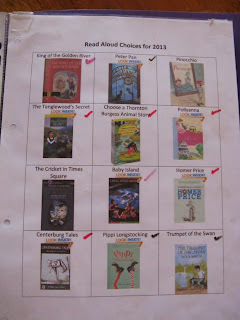 I also divide the free-reads (both Ambleside’s suggestions and other books I have chosen) into a family read-aloud list and an independent free-reading list for each child who can read independently. Part of our list of family-read-aloud choices for this past year. Many of our books are on the Kindle, so this is our virtual ‘bookshelf’ for the children to choose from, if you will. I like to snag the cover art off of Amazon to put on the list so the kids can scan their choices the same way they would on a real bookcase. For any subjects I am changing or adding in on my own, I make a plan to work these into the Ambleside weekly schedules. For example, this coming year we are planning to follow our own schedule for Bible study rather than using the Bible readings scheduled for Year 2. So, I will divide up the readings and any supplementary materials week by week so they will be ready to plug into my term checklists. Same thing for the mapwork on Europe that I am planning to add in. I don’t do these things all at once, I pick at them as I feel inspired and have a spare moment or two. I do like to have them done at least a month or so before the first term starts so that I am ready to sit down and do my nitty-gritty term planning. Poetic Knowledge: What is It?